Do you have cymbidiums that are nice and healthy, but no flowers? You're not alone. Until this year we haven't had much luck getting them to bloom either. These plants can be stubborn bloomers in our climate here in New Jersey. Last year was different! We've had oustanding success - and we want to share it with you! Cymbidiums in full bloom. What a show! This plant has over 60 flowers on 5 spikes! Cymbidiums just aren't happy indoors year round. They require lots of sun and chilly temperatures at night (40-50 degree range). Growing indoors in a sunny window will get you a healthy looking plant - but no blooms. In our climate, moving these plants outside for the summer and fall is the only way to go. Outside, cymbidiums use the summer sun and cool evening temperatures to build up the energy for those big, bright flowers. Leaves are always a good indicator of proper light levels for cymbidiums. They should be light green with a tinge of yellow - dark green means not enough light and your plants won't bloom. Too much sun and the leaves will turn yellow or bleached white. 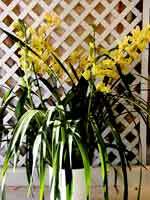 To initiate a flowers spike, cymbidiums need cold temps at night - in the 35-45 degree range. (Techincally, these plants can withstand temperatures as low as 27 degrees!) Our plants stayed outside until the weatherman gave us a freeze warning on Nov. 16th. They endured several nights where the ground was white with frost. We brought them into the greenhouse and set evening temperatures at 50 degrees. A cool window in an unheated room would work here. Don't worry about sun, your plant has stored up enough energy from being outside for blooming. Cool temps are important though. Developing buds will turn yellow and fall off if temperatures go above 55 degrees during this period. Once the flowers begin to open, the plant no longer needs the cool so display it anywhere. We noticed our first flower spikes around January 1st with flowers opening several weeks later. With good air circulation blooms will last for 6 weeks or more. Unfortunatley this Cymbidium wiil never reach its potential growing in potting soil indoors. Cymbidium outside building up the energy for big, beautiful blooms. Our cymbidiums really responded to our hydroponic system outside. The LECA pebbles are clean and easy to use, making an excellent growing media for these plants. Their "wicking action" delivered the right blend of oxygen and nutrients to the roots resulting in robust plants. And you never have to worry about the media breaking down and compacting around the roots causing root rot. Watering was easy too. We replaced the outer pot with a shallow saucer to avoid overwatering. Exposed to the elements, the outer pot would collect too much water from rain showers. Replacing it with a shallow saucer allowed the excess water to drain away. 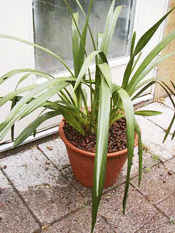 Cymbidium roots growing in LECA pebbles. Cymbidiums use copious amounts of water during their growing season outside. When the water gauge reads "Min", go ahead and water. Very little "dry time" is needed between waterings. We still waited for the system to be dryout before rewatering however. Using a shallow saucer as the resiviour prevents overwatering because the excess will drain away. 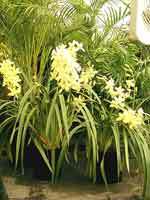 Cymbidiums are heavy feeders during the growing season. Dyna-Gro Bloom 3-12-6 provides a balanced diet that's high in phosphorous and potash - good for flowering. Then, we added a dose of Mag-Pro 2-15-4 (along with the Bloom) every couple of waterings for real boost. For Cymbidiums we use "deep" Grow Systems. "Deep" Grow Systems are 8" deep compared to only 5" deep for regular systems. The taller profile of these pots makes them ideal for cymbidiums.